Material stolen by intruders from the North Korean Embassy in Madrid in February has been returned by Spanish authorities to Pyongyang's mission without a review of the contents, a Spanish judicial source said on Tuesday. Investigators said the intruders, self-professed members of a group seeking the overthrow of North Korean leader Kim Jong-un, removed computers and hard drives from the embassy before fleeing to the United States, where they handed the material to the FBI. The Spanish judicial source said the FBI returned the material two weeks ago to the Spanish court investigating the raid. The court did not review the material before turning it over to the North Korean Embassy, in keeping with standard practice to protect diplomatic information, the source said. Another source, familiar with the U.S. government involvement in the case, confirmed the FBI had returned the material to Spanish authorities. It was not known how the material was handled while in the United States. A group of at least 10 people stormed into the embassy in February, restrained and physically beat some personnel and held them hostage for hours before fleeing, the Spanish court said earlier. The anti-Kim group, which calls itself Cheolima Civil Defense, said the raid was not an attack and that it had been invited into the embassy. 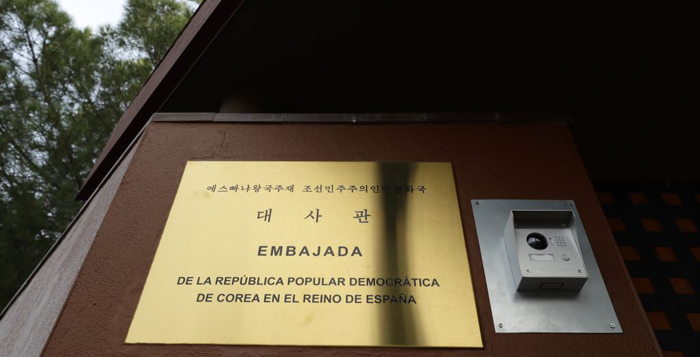 Three of the intruders took an embassy official into the basement during the raid and encouraged him to defect from North Korea, according to a detailed document made public on March 26 by the Spanish court. The document included the names of the leaders of the group, some of whom are believed to be in the United States, while others could have left for other countries. The court is seeking their extradition. The judicial source said the investigation into the incident was almost complete, including interviews with all witnesses. North Korea's foreign ministry denounced the incident a "grave terrorist attack" and cited rumors that the FBI was partially behind the raid. The U.S. State Department said Washington had nothing to do with it.